Sometimes, even though it shouldn't be, writing is hard and joyless. Sometimes we just don't love it like we used to. This happens when we care too much what other people think. Worrying that nobody is going to like what we have written, is the easiest way to turn the writing life into hell on Earth. In the end, the only thing that matters, is that we are writing what we want to write, what we have to write, whether anyone else cares or not. When a writer is too concerned that their writing isn't good enough, he or she cannot enter the Flow, that sensation of losing track of time and place and just falling into the story as it unfolds. You know what I mean, you've been there. In Fearless Writing, Kenower addresses why we procrastinate or stop writing altogether and what we can do about it. At the end of each chapter, he offers writing exercises to practice writing fearlessly. My favorite was a guided medition at the end of Chapter 9, Writing is Listening. Try it, it works. You're going to find something to love in the chapter titles: A Writer's Worst Fear, Feel First, Finding Time to Write, The Talent Myth, and Fear of Failure. Chances are, you will find what you need. 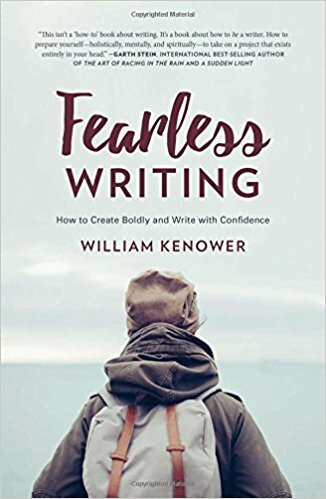 If your love for the craft has waned, I recommend that you read William Kenower's Fearless Writing. This is a deliciously written book. As the cover quote says, "It isn't a book about about how to write, it's a book about how to be a writer." In this book, Kenower tells us something absolutely revolutionary. Writing is supposed to feel good. Enough with all that writing-is-pain, suffer-for-your-art nonsense. Writing isn't so much about self-discipline, but about falling in love with the work. Kristina Horner films herself daily, every year, while taking the NaNoWriMo challenge in November. She posts the funny and refreshing summary to YouTube. In 2016 she got to spend half of November in Freaking France in a Freaking Castle. The video is less than twelve minutes, check it out: Writing a Novel in a Month (2016). Jenna Moreci has created a YouTube video called The Nine Weird Habits of Writers." Warning: salty language ahead. Well I'm sold. I need this book! Thanks, Ronda. That sounds like an excellent resource, Ronda. Another book I really like is called "Fierce on the Page" by Sage Cohen. The subtitle is "Become the writer you were meant to be and succeed on your own terms." The chapters are short--most are two to four pages in length--and many of these are followed up by a "Be Fierce" challenge. Here's a link to the author's website: http://fierceonthepage.com/ Write on, NaNoWriMoers!! We've got this. April, you won't regret getting this gem of a book. Laura, I'm going to have to check out "Fierce on the Page," it sounds just like my kind of book! And for all you NaNoWriMites, you are over half way now! Keep going!!!!! !